(Francisco Kjolseth | The Salt Lake Tribune) Artist Dourone works on a mural outside Clark Planetarium on Monday, Oct. 9, 2017. 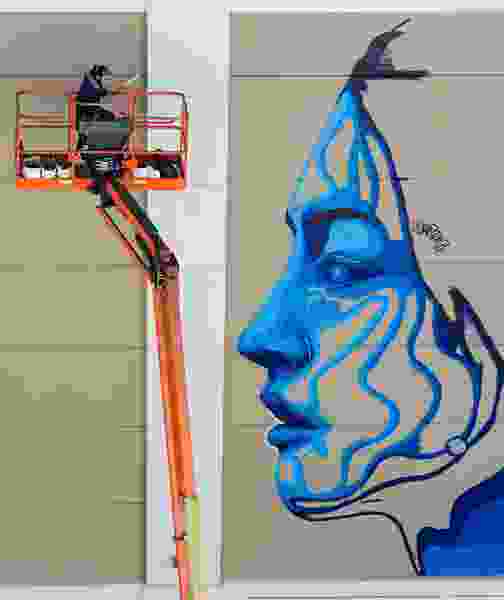 (Francisco Kjolseth | The Salt Lake Tribune) Mural artist Fabio Lopez Gonzalo, aka Dourone, continues work on a large piece on the Clark Planetarium wall entitled "Two World Faces" on Tuesday, Oct. 10, 2017. Dourne, who started out as a mural artist in Spain, and other internationally renowned artists are creating art installations at The Gateway in downtown Salt Lake City in an effort to transform the public art landscape. As part of The Gateway’s renovation and reimagining, Spanish artist Dourone, aka Fabio Lopez Gonzalo, is painting a mural on a Clark Planetarium wall. His “Two World Faces” on 100 South is underway this week while art collective 2Alas’ “Loretta Young” goes up above TRAX’s Planetarium station on 400 West. The Gateway is shifting into an entertainment-focused gathering place after the 5-year-old City Creek Center mall siphoned much of its business.